There’s nothing quite like watching the Blue Angels, the U.S. Navy’s flight demonstration team, perform aerial acrobatics near its home base at Naval Air Station Pensacola. Most everyone enjoys watching fast planes, and if the sight of their vapor trails doesn’t send you daydreaming, then the sounds of the screaming jets roaring overhead is sure to get your blood pumping. 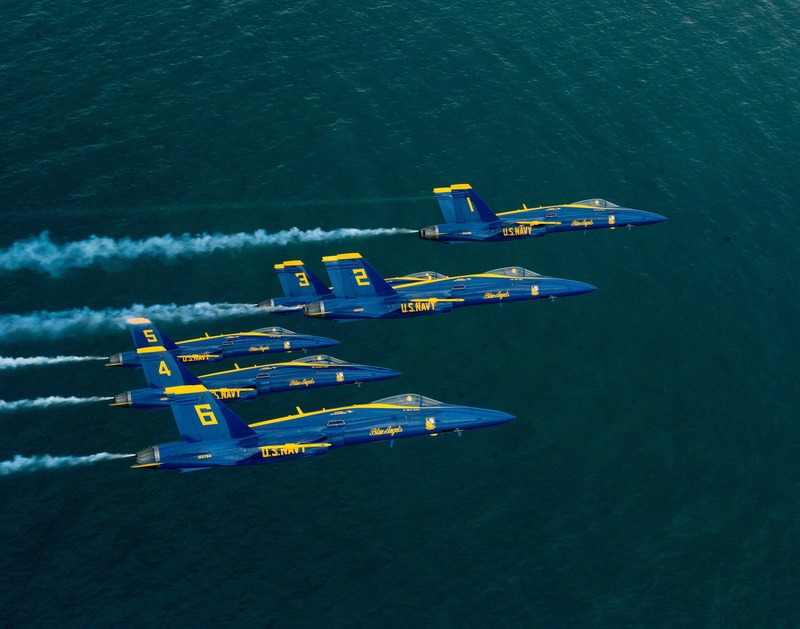 A beach getaway centered around the Blue Angels, who will have top billing at the July 15 and 16 Pensacola Beach Air Show, could possibly be the most American vacation possible. Not much can beat enjoying beautiful beaches, warm sunshine, gentle breezes blowing off the Gulf, and the coolest display of aircraft maneuvers ever seen – all in one trip. 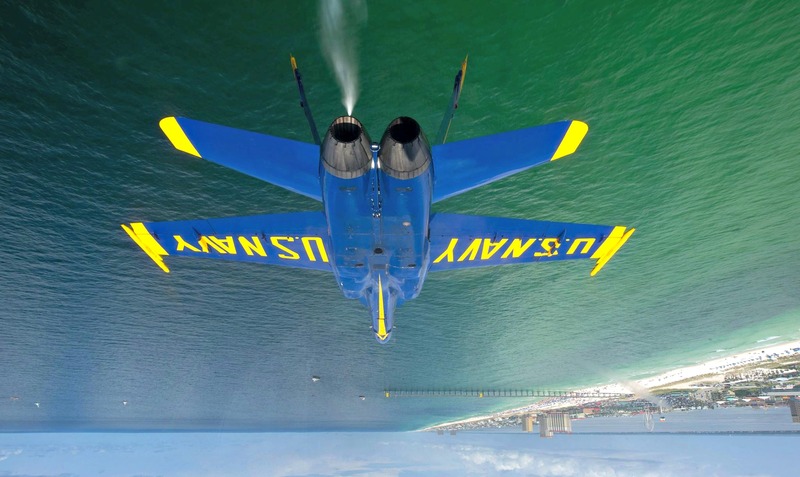 However, as exciting as the Blue Angels air show is, you need to keep in mind that Pensacola Beach has a semi-tropical climate, and that means that the weather is typically hot and humid in July. With that in mind, here are some tips that will make your air show experience both safe and comfortable. soak up less heat than darker colors, while loosely fitted clothes made of lightweight materials will “breathe’” and help keep you cool. Don’t forget a wide-brimmed hat, too, which will provide some shade for your face and keep your head cool. Oh, and speaking of your face — do yourself a favor and protect your eyes with a quality pair of sunglasses with UV protection. Remember that you will be looking up into the sky for an extended period, so make sure you protect those peepers! – Stay hydrated. The Florida sun can dry you out much quicker than you realize. However much water you think you’ll need, bring twice as much. If you really want to avoid dehydration, increase your fluid intake the day before the show. Drink cool water during the event – but not icy cold, to avoid stomach cramps – and resist the urge to drink alcoholic beverages while in the sun. Save the spirits for after the show when you are out of the heat. – Don’t forget the sunscreen. Nothing can spoil a beach vacation faster than a sunburn. So, lather up early and often! 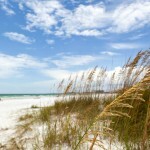 The sugar-white sands for which Northwest Florida is famous are excellent reflectors of the sun’s bright rays. That means you are not only getting hit with it from above, but from below as well. Apply sunscreen (an SPF 30 product blocks 97 percent of UVB rays and is considered optimal) about 30 minutes before going out, and then reapply often. Besides being painful, a sunburn can damage your skin. So be generous and don’t be afraid to ask for help applying in often-forgotten and hard-to-reach places like the back of your neck and your ears. – Make seating arrangements. While the air shows typically last about 45 minutes to an hour, most visitors make an entire day of it. Getting there early means you’ll get a great spot from which to watch, but it also means possible prolonged standing. Bring along some lightweight lawn chairs or seat cushions and take a load off. Of course you’ll be standing during the show from the sheer excitement, but your feet will thank you for the seating in the hours leading up to the event. Tempted to just sit on the beach? Consider that the sand is not only reflecting the sun’s rays but is also soaking them up and holding them in. Unless you are under an umbrella or some other cover, the sands are probably too hot to sit comfortably. – Mind the sounds. During the July show, six F/A-18 Hornet jet fighters as well as a handful of other vintage aircraft, will be flying at low altitude for up to an hour. To put it in perspective, that is 12 turbo-fan engines (two on each Hornet) and a host of other engine types producing tens of thousands of pounds of thrust. That’s a lot of noise in a short period, so be especially careful with small children, the elderly, and others who might be sensitive to loud noise. Ear plugs might not be the coolest-looking accessory for the beach, but they can really help prevent ringing in your ears after the show. – Mind the traffic! Be aware that thousands of people flock to the area to witness this public display of pride and patriotism. There will be heavy automobile and pedestrian traffic in the hours preceding and following the performance, so plan some extra time to get to your spot – and don’t get in a hurry to get gone. Instead, kick back, relax, and enjoy discussing your favorite aircraft or maneuver from the show with your family and friends. Remember, you’re on vacation! The vapor trails the aircraft leave in their wake while performing are not harmful. The smoke is produced by biodegradable, paraffin-based oil being pumped into the exhaust nozzles. The oil is vaporized instantly, leaving the vapor trails behind. The trails pose no hazard to the environment and serve as both safety measures – allowing pilots to “see” one another during maneuvers – and to make it easier for spectators to follow the show. 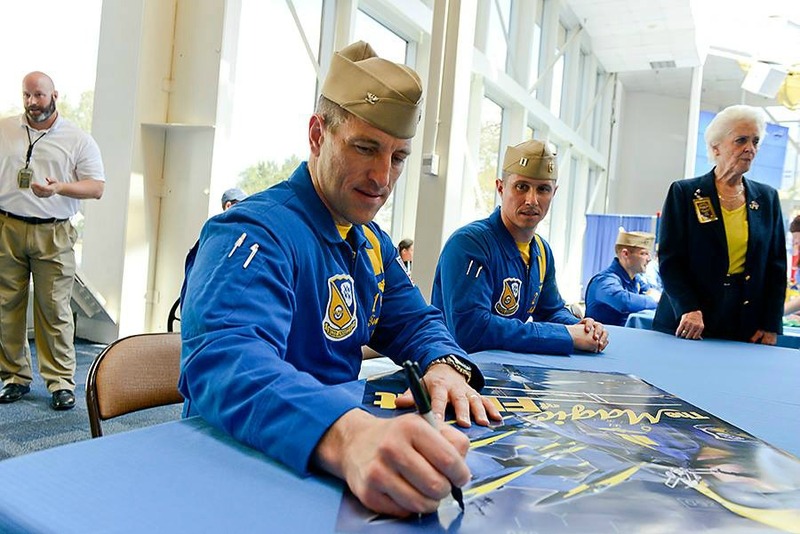 The Blue Angels sign autographs at Pensacola’s National Naval Aviation Museum after their practice flights. 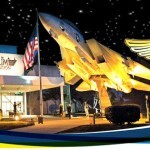 You can typically catch a glimpse of the Blue Angels flight team practicing on Tuesdays and Wednesdays from March through November in the skies over the National Naval Aviation Museum. Practices can be seen from the museum grounds beginning at around 11:30 a.m. and lasting for about 55 minutes. There is no charge to watch the show, and admission to the museum is also free. Finding a condo, hotel, beach house, or other vacation rental is easy when you visit our links at Pensacola Beach Vacation Rentals. You’ll find rates, amenities, and more, including convenient online booking for many units. 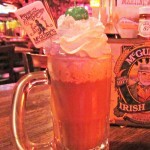 We can help with suggestions on where to eat while you’re in town, too, at Pensacola Beach Restaurants. 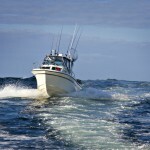 Also find Pensacola Fishing Charters and more fun things to do in Pensacola Beach, Florida. Just visit us online!